Two years ago, former Huffington Post (s aol) chief technology officer Paul Berry launched a site called RebelMouse to give media companies and users of all kinds a way of aggregating the various pieces of their social presence — from blog posts and Tweets to Facebook updates and Instagram photos. Now the site is being relaunched as a full-fledged publishing platform, one that is designed to give both media companies and advertisers control over every aspect of the real-time social ecosystem as it relates to their content. Berry said in an interview that while there are many media outlets with a large web presence, very few are good at the technical underpinnings of real-time publishing, or understanding the way that content behaves on the social web. Companies like BuzzFeed and Bleacher Report and Medium understand this, the RebelMouse founder said, but the recent New York Times innovation report makes it clear that even with massive resources, it’s still hard to break out of old patterns. There are very few media companies that are also awesome technology companies. You can see that in the NYT’s innovation report: even with hundreds of developers you can have difficulties adapting to the way things work online. And the place where they usually fall down is community and social engagement — and that’s the focus of the new RebelMouse. Berry is quoted in the New York Times report as saying that with traditional publishing, the point at which a story appears in print or online is seen by many as the end of the process — but at online publishers like Huffington Post, it is only the beginning. What the NYT admits it has to do a better job of is being part of the social conversation around its stories after they appear, and that is exactly what RebelMouse is designed to do, Berry says. Because the RebelMouse platform has been built from the ground up to take the various social elements of a story into account, Berry says it can help media companies — or brands that wish to act like media companies and content creators, as an increasing number of them do — to expand their social reach, figure out what is working and then build on that quickly in order to take advantage of it. While other companies provide bits of this package, Berry says none have them all incorporated into a single publishing and hosting system. Our competition is really just people who build their own thing — hiring developers to hack a Tumblr blog or whatever. But it’s really hard. And WordPress is a fantastic platform, it’s totally awesome, but you get a very thin product if you don’t put in a lot of development time to make it do what you want it to for the social web. Berry says that The Dodo — which was launched earlier this year by Isabel Lerer (the daughter of venture financier Ken Lerer, an original backer of Huffington Post, BuzzFeed and RebelMouse) — uses his company’s services to publish, and has been able to increase its social reach and traffic by orders of magnitude more than it would have without the viral-content features. After a single month of publishing, Berry says the site hit one million unique visitors, and after just three months it is getting more than 7.5 million visitors. Editors like using the site’s custom writing tools — the RebelMouse founder calls them a mashup of Medium, Tumblr and Huffington Post — but the platform also makes it easy to plug the content they create back into social networks like Facebook and then track what happens. And that allows publishers like The Dodo to build on whatever viral hits they do generate. 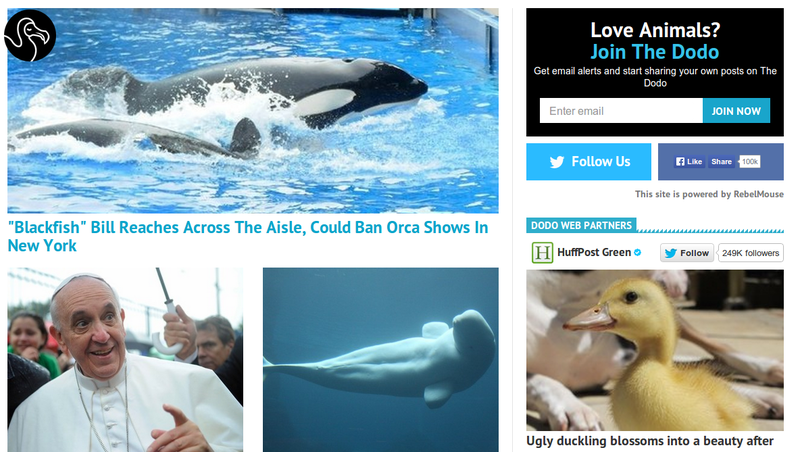 As an example, Berry says the Dodo’s post on the treatment of killer whales at Seaworld got almost a million likes on Facebook, and — using some of the social “call to action” tools that RebelMouse has built — the site also asked anyone who saw the post to sign a petition against Seaworld, and to write a blog post about their reasons for doing so. More than 100,000 people signed the petition, about 80,000 became members of The Dodo and 100 people wrote blog posts, which in turn generated another 100,000 or so pageviews. We can give them stats on depth of scroll, amount of time on mouseover, velocity alerts and so on, tracking all of their social content. We can track retweets, so we can move a story to the top of most popular if it’s doing well, and we can generate daily email summaries of the most popular content — and then brands can take that and use it in advertising campaigns. Thanks Mathew, for the good effort. I have myself headed to my own Rebelmouse account, but probably due to my ineptitude, I have only noticed several cosmetic changes to the UI, the dashboard panel been moved to a sidebar and one new feature in the design section allowing for the top bar to stay fixed as you scroll. I am sure there’s a lot more good stuff that the guys at RebelMouse must have put into this new release, but I have failed to really discover it. Did you, or anyone else reading this, have any better luck at this? Thanks Robin â€” some of the features are still being rolled out as I understand it. Sorry I couldn’t provide more detail.